by Penson, John B.; Capps, Oral, Jr.; Rosson, C. Parr, III; Woodward, Richard T.
A systematic overview of the economic forces influencing the food and fiber industry . Introduction to Agricultural Economics provides students with a systematic, building block introduction to the basic economic concepts and issues impacting the U.S. food and fiber industry today. Thorough coverage of microeconomic and macroeconomic theory, the role of government, and international trade policies allows readers to gain an understanding of domestic consumers and overseas markets. Each chapter offers extensive review opportunities that let students test their knowledge of important concepts and prepare for exams. The Seventh Edition has been thoroughly revised to provide the most up-to-date coverage of the dynamic food and fiber industry within the global economy. John B. Penson, Jr., holds the titles of Regents Professor and Stiles Endowed Professor of Agriculture in the Department of Agricultural Economics at Texas A&M University. He is also a senior scientist with the Norman Borlaug Institute for International Agriculture. Penson received a Ph.D. degree in agricultural economics from the University of Illinois. Penson has taught courses in Korea, Japan, Guatemala, Nicaragua, and Ecuador. His research has focused on the macroeconomics of agriculture and portfolio credit risk analysis. He has also conducted research in the Middle East and Eurasia. Oral Capps, Jr., holds the titles of Executive Professor and Regents Professor in the Department of Agricultural Economics at Texas A&M University. He is a certified business economist and co-director of the Agribusiness, Food and Consumer Economics Research Center at Texas A&M University. He is also holder of the Southwest Dairy Marketing Endowed Chair. He received a Ph.D. in agricultural economics from Virginia Tech. He has received numerous teaching and research awards and is recognized internationally for his research in demand and price analysis. C. Parr Rosson III is Professor and Department Head of the Agricultural Economics Department at Texas A&M University. He received his Ph.D. in agricultural economics from Texas A&M University. Rosson works in the areas of international trade and international marketing. He currently chairs the Education Committee of the Texas—Cuba Trade Alliance. He served on the Grains, Feed, Oilseeds and Planting Seeds Agricultural Trade Advisory Committee for the U.S. Trade Representative and U.S. Department of Agriculture from 2001 to 2015. He has conducted projects in Latin America, the Middle East, and Asia. Richard T. Woodward is Professor in the Department of Agricultural Economics at Texas A&M University. His research is in the general area of environmental and resource economics. His recent research projects have focused on the use of transferable permits to address water quality and fishery challenges and problems of choice under uncertainty. 1. 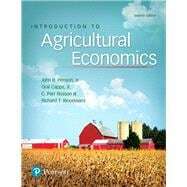 What is Agricultural Economics?